TSN's NHL Fan Zone - Late Additions? Brendan Shanahan's new-school Toronto Maple Leafs front office built on his philosophy of differing viewpoints has a new voice, and this one comes with some 30 years of NHL experience. Shanahan, who's a year into his duties as team president, believes new general manager Lou Lamoriello "will fit in very, very well and be an incredible boost" to what the Leafs are trying to accomplish. Shanahan went looking for experience to join Kyle Dubas, Mark Hunter and Brandon Pridham in management, and no one has more than Lamoriello. "If I could map out or draw out a description of the kind of person that we wanted, it would be Lou," Shanahan told a news conference Thursday. "I've always thought that there are certain advantages to hiring people on their way up that are looking to prove themselves and have that sort of hunger and energy to make a name for themselves. But I do think that we were lacking in some experience." In charge of the New Jersey Devils since 1987, the 72-year-old Lamoriello was the longest-serving GM in NHL history. Along the way, his teams won the Stanley Cup three times, a pedigree he brings to the Leafs, who are trying to build a championship contender. Lamoriello becomes the old-school GM working under the Hall of Fame player and overseeing assistants Hunter, Dubas and Pridham, also NHL management rookies. He'll also work with coach Mike Babcock, who's signed for eight years and US$50 million and has committed to a long-range plan for success. "Brendan's hired some very good people kind of a little bit on an entry level, at the levels they are coming into the league," said Pittsburgh Penguins GM Jim Rutherford, who made a similar transition last year leaving the Carolina Hurricanes. "To add an experienced guy like Lou, I think it was very smart on the Leafs' part, and it'll be a good fit." Lamoriello's comfortable fit for the past 28 years was gripping the reins of the Devils and asserting just about total control. New Jersey was his team until Ray Shero took over as GM in May, leaving Lamoriello as team president. "I think this benefits everyone," Shero said. "He's a pretty amazing person, and he's in the Hall of Fame for a reason. They're going to find that out." Although Lamoriello said he was told he'd have autonomy as GM, Shanahan made it clear in conversations "the kind of environment and organization" of collaboration he was building. Lamoriello is OK with Shanahan not wearing a tie to work every day and might have to let Hunter keep his facial hair, and he's fine with sharing decision-making responsibilities. "No one makes any decision without consulting the people that are around them and their supporting staff," Lamoriello said. "Everybody works together. They don't work for each other. Everybody will be part of every process." The process of remaking the Leafs is already under way. Since taking over, Shanahan fired several assistant coaches, executives and scouts, Randy Carlyle and Dave Nonis and presided over the trade of Phil Kessel to the Penguins. Yet there are still plenty of big decisions to make, as Kessel is unlikely to be the only core player sent packing. Shanahan is still setting the vision, but now it's Lamoriello's job to execute it. "We know the roster needs some work," Lamoriello said. "You have to have a foundation before you can go anywhere. Yes, it could be slower, there could be more pain, because there could be more subtractions sometimes than additions to get that foundation with the right culture going forward." Shanahan wanted someone with a wealth of experience in control. Among the handful of candidates he spoke with, Shanahan singled out former Washington Capitals GM George McPhee as a finalist. Lamoriello had a relationship with the Leafs' president dating to 1987, when he drafted Shanahan. Ultimately Shanahan convinced one of his mentors to sign on in Toronto and was willing to pay the compensation price of a third-round pick to hire him. 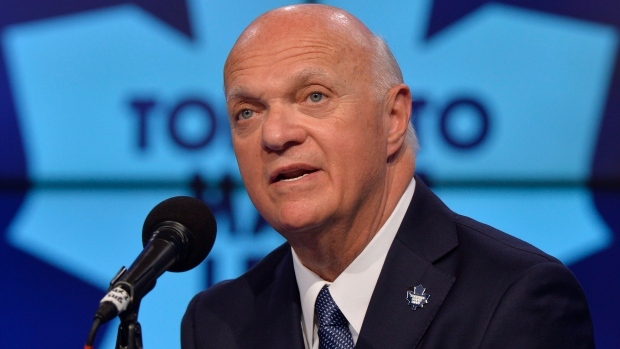 Signed to a three-year deal, Lamoriello will be almost 76 when it expires. One of his duties will be to mentor the 28-year-old Dubas, who Lamoriello believes will grow into an NHL GM. "I think having Lou in the organization is an opportunity for him to mentor us all," Shanahan said. Long-term success will be measured on the ice, but how this management group fares will go a long way to determining the Leafs' organizational direction. Lamoriello believes winning comes when players mix like an orchestra, and the same can be said about the front office. "I think that this orchestra works well with Lou," Shanahan said. "I think Lou has assets that we need and that we're looking for, but I also think that the rest of the guys that I've assembled here are going to be good for Lou."